In the south of Aharen Village there is Aharen Beach, and it is surrounded by a lot of mysterious stones and rocks which were formed by wind and rain. It is about 800 meter long with white sand, and not to mention, it is crowded with people in summer. Irresistibly Beautiful Aharen Beach The most attractive part of Tokashiki Island is its translucent sea. 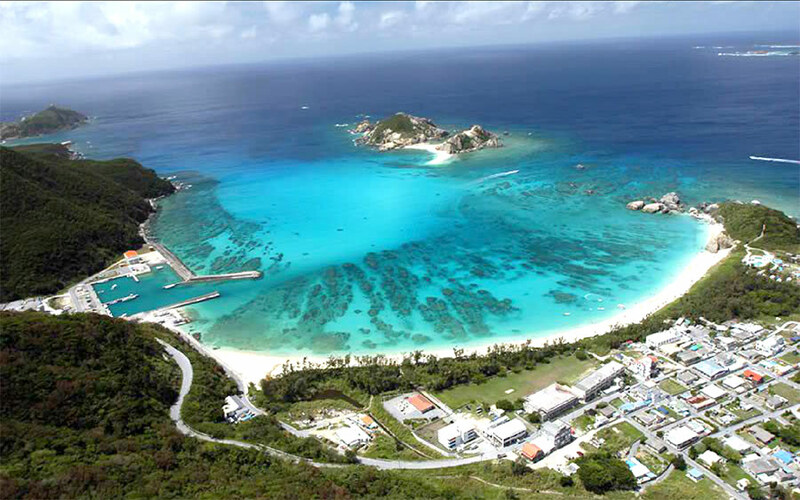 It is one of the world's finest seas, with coral reefs and transparency as deep as 50 meters. On the perimeter of the island lie several beaches full of pristine white sand. And the northern part of this beach is well known as suitable spot for snorkeling. Marin shop eaves when it comes to the season, will show the bustle seems to tropical. Also equipped with toilet and shower room, also rental of such umbrellas has been enhanced, it is just wrapped in an atmosphere reminiscent of a tropical paradise. In Aharen Village in the west of Tokashiki Island, there is Aharen Promenade which is about 1.5 kilometers long. Aharen Observation Tower stands in Teruyama on the middle part of this road. You can see Kerama Islands such as Aka Is. or Zamami Is. from the top of this tower. The wonderful sight is beyond description. In February, Tsutsujis (Azaleas) bloom all over around this tower, which allows you to come into contact with nature.